"Good fences make good neighbours." A fence is a guard against intrusion. Although a fence most often marks a boundary, the point of a fence is not to mark the property boundary but to control or impede ingress and egress to real property. A fence will not be taken at law as absolute proof of a boundary line although it may serve as evidence thereof. "At common law, in the absence of a specific duty arising from agreement ... , or custom, there is no implied obligation upon a landowner to fence his land either against or for the benefit of his neighbour or the public. "There is, however, a common law duty to erect a fence ... where the absence of a fence would constitute a nuisance...."
"... obligation to maintain a cattle-proof boundary fence upon one's own land...."
In many cases, statutes exist that require a land-owner to erect a fence, such as around swimming pools, mines, quarries, electrical plants, transmission towers in urban areas, and any building scheduled for demolition. Some statutes specifically provide for fences upon boundary lines, although this is merely a restatement of the common law. "An owner of land may construct and maintain a fence to mark the boundary between the owner’s land and adjoining lands." Generally, the cost of maintaining a fence that falls on a boundary is shared equally between the landowners. "When 2 owners or occupiers of adjoining parcels of land desire to erect a line or boundary fence between the adjoining parcels for the common advantage of both of them they shall bear the expense of the erection, maintenance and repair of the fence in equal shares." Municipal by-law is always an essential place to verify as to source of fence law as some jurisdictions prefer to have fence law set by local government rather than attempt to impose a standard upon a large, disparate territory. Thus, where a land-owner voluntarily opts to erect a fence, he or she will likely have to comply with municipal by-laws in regards to height. For example, 6 feet in height if facing a neighbour or 8 feet in height if facing a roadway or common land. 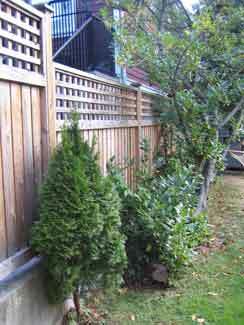 Hedges or natural fences, are often restricted to a height of between four and eight feet. Further, municipal bylaws may require that the fence be setback from roadways, walkways or common land. For example, the City of Victoria, British Columbia, Canada has a Fence Bylaw (No. 93-112) which provides for a maximum height (1.22 metres/4 feet or 1.83 metres/6 feet) unless built of an open design. "... once a fence has been erected, the cost of repairs or maintenance to a division fence shall be borne equally by the owner and the adjoining owner. "If a tree causes damage to a division fence, whether by accident, or one or more persons carelessness, negligence, deliberate intent or otherwise, the owner of the land on which the tree stood shall, at his sole, expense, forthwith remove the tree and repair the fence." A fence with no beneficial purpose but to annoy a neighbour may be a spite fence and give rise to a claim in nuisance as well as the self-help remedy of abatement.